this makes our life so much easier. it keeps up with our 2 cats. 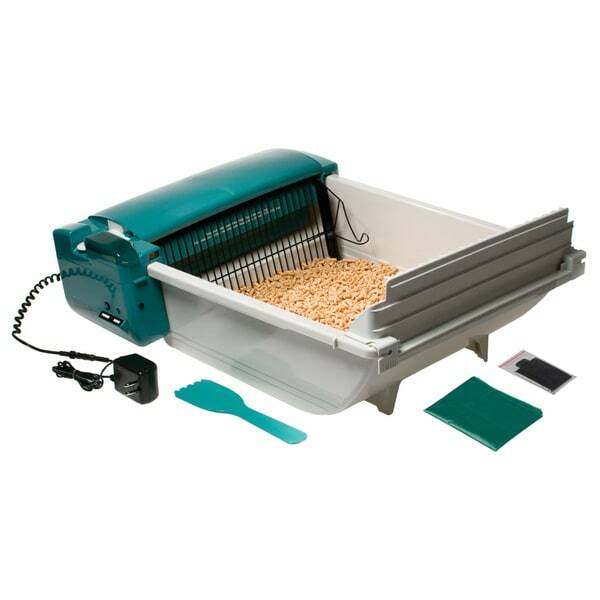 Automate away the messiest part of caring for your cat with this Pet Zone SmartScoop green cat litter box. Waste is scooped into a tray immediately after your cat relieves itself, keeping odors contained. works great now we don't have to touch the litter Have two cat empty the hopper every other day and no issues. I found if I just use a store plastic bag to empty the hopper into and leave the green bags that came with unit, it is easy to clean. Great Litter Box, extremely happy with this . What can I say this is a great litter box and the price what right. My cats love it I love it gives me more time for me and cleaning other messes up besides scooping up poop. Do yourself a favor if you have cats get one of these..
My cats don't like it. My cats don't like it because the litter depth is too low. This is a common problem with auto clean cat boxes. I have 2 cats and the recommended number of litter boxes is two for indoor cats. They LOVED the depth of 3-4 inches recommended by the litter maker in the high sided box I purchased. The 1 to 1 1/2 inch or so of this product didn't make them happy. They haven't used this product in over a year and a half. They are 2 years old. Update: 1/17/19 Everything is still the same. Except the cats love to investigate the sound this makes when used. The only difference is that they will use it if forced. Meaning when I'm cleaning the other one and they can't wait. Hahaha! Very great product I was affraid that my cats wouldn't want to use it at first because when I had gotten it put together and it ran for the first time they ran. After getting the litter put in it I used the smart scoop odor eliminating spray and put one squirt in it. Within just a few minutes one of my cats had already gotten in and used it. I have 4 cats so I'm beyond thankful to find a liter pan that automatically scoops out the waste. Changing a litter pan everyday had become a daunting task. With this now I will be able to save money and time. Assembly of this liter pan was a breeze to not hard at all and all four cats have been using it with no problems. I purchased this for my sister in law to use at her house when she is fostering my female Ragdoll. I would not like it for more than 1 cat, as it does not have a large capacity, but it is great for a single cat. Broke in less than 2 months. Used as directed, only on cat used it and suddenly moves but rake doesn't pull up because one side of the machine doesn't stop and moves over the rake. Total worthless item. This was my second automatic litter, had a Scoopfree which worked well for one cat but recently got a new kitten and needed another box and the Scoopfree refills can be expensive. This litter box worked ok but the scoop didn't catch some of the clumps and would leave clumps at the bottom. Also the bin that catches the clumps is small so there was a need to change the litter box quite frequently, daily really. I ended up still needing to scoop daily so I saved up and invested in a Litter Robot and that has been a far better investment for my two cats. My husband cleans the cat boxes so I bought this to help him out a bit. He could never get it working properly so he just gave up. What a waste of money for me. Now we just use the bottom part as just a boring, static litter box. This isn't everything I was hoping for. It makes a horrible mess and it doesn't pick everything up. I put it in my garage. It definitely helps with the smell that can accumulate and the final cleanup, but it also requires a lot of maintenance. Little bits of litter can get in the mechanisms very easily and it starts to make a horrible noise sometimes because of it. a little hard to assemble but does work well and does help to ease on the daily work required. Both adult and kittens are using it. This little box has made it a lot easier, having two kittens. I am still trying to get used to how much litter needs to be in there though for it to work properly. Even with the fill line, its iffy. I have also discovered that the plastic grocery bags work great for the tray that you empty.. great purchase! Fabulous product keeps the area clean and I no longer have to bend and spend time cleaning the sand, the rubbish is wasted once a week without the smell remaining. it is activated 15 minutes after the cat leaves the sandbox. Must check daily to make sure it is not stuck, however it seems to be working fine! I will check back after a year... 6 months...Got stuck, gear broke...Thrown away....Don't forget to check it all the time! Defeats the purpose of Automatic, I think! This works ok. It catches about half. Still have to scoop like a normal litter box. Bought this for my daughter's cat when my daughter moved into her first apartment. It worked well and saved her having to clean the litter box daily but she said the soiled litter would get caught on the rake on occasion which made its little harder to clean. "Can I use any litter in this or is it a special litter"
"Can I use any litter or is it something special I have to use"
"How much does the bags cost?" "hi will this litter box do for a cat that is 33 pounds"
Hello Teresa F., we do not currently weight test items. We apologize for any inconvenience. Thank you for shopping with us. "Where do I get replacement bags?" Hello Maggie. For assistance with this issue please contact Customer Care at the number below. I hope this helps, thank you for shopping with us! U.S. and Canada Toll free: 1-800-The-BIG-O (843-2446). "This product does not mention overall size. I need exact size and height needed as it needs to fit in a specific area." Hello Crystine F., this item is approximately 26.58 inches long x 16.88 inches wide x 7.6.3 inches high. Thank you for shopping with us. "Is a particular type of litter required for this unit?" Hello schoooter, any type of light clumping litter will work with this unit. Thanks for shopping with us!